There is just something so… likeable… about the ubiquitous maple and birch kitchen cabinets that filled American homes for– how long? — from 1935 (or earlier) through to 1970 or so? These cabinets are both warm — and durable. They are also classic, mid-century unpretentious: They say “I’m vintage… I’m original” — but not in a flashy way that may wear you out over time. 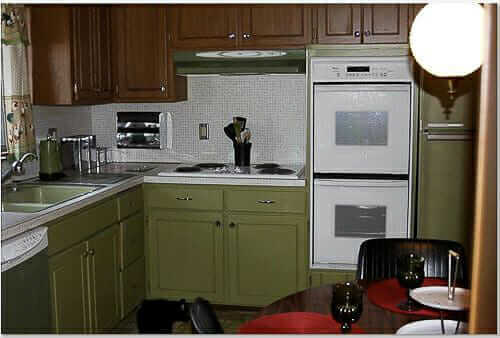 I *know* the desire is strong to want to repaint these wood cabinets when you first move in. Hey, I did it once, in the very first home I owned, a 1938 mid-century modest. 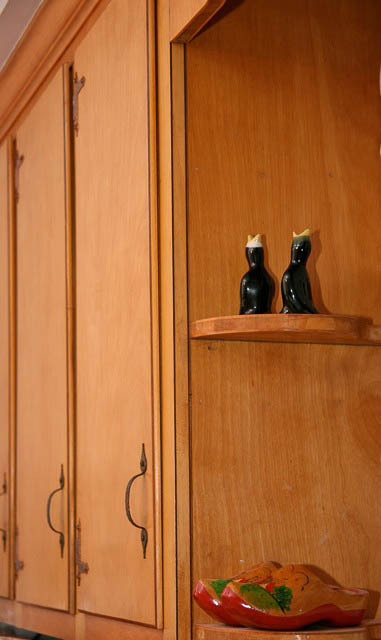 But as shown in Donna’s kitchen today, if these cabinets are still in good shape — they can be gleeming lovelies. 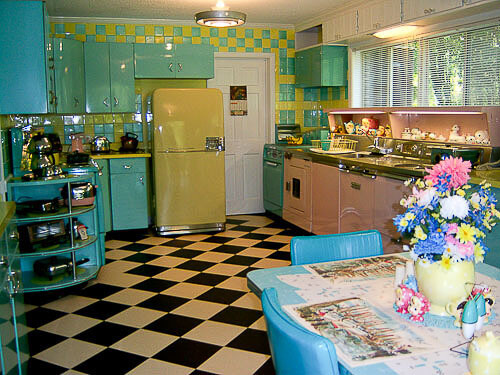 With some modest updates — in this case, a new checkerboard lineoleum floor — this kitchen is ready to do its cheerful duty for another couple of decades. 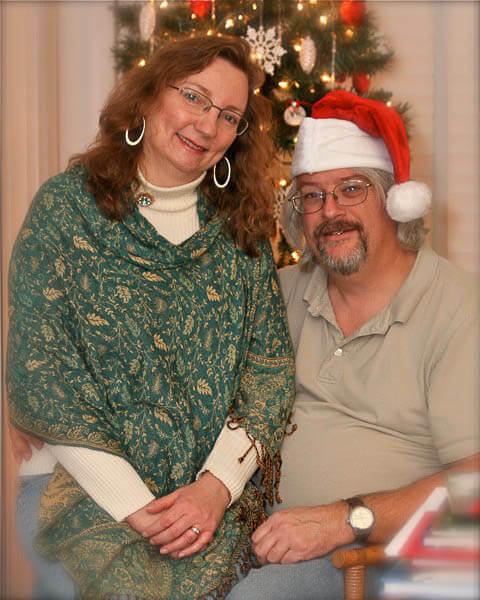 Read on for Donna’s story…and some more great photos of this sweetheart kitchen. 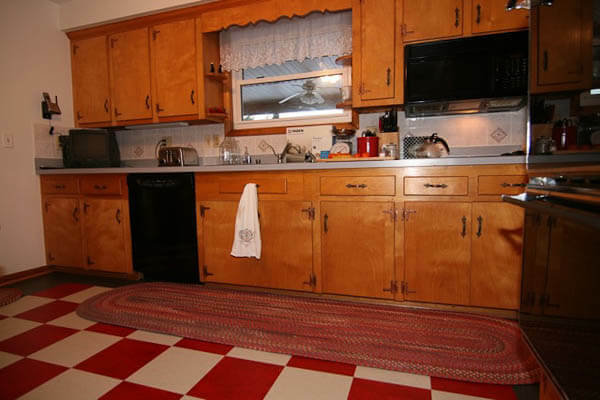 I have finally taken photos of our new red, light- and dark-gray checkerboard Marmoleum kitchen floor, complete with Capel braided rugs, as well as two or three of the common but classic kitchen elements that ‘sold’ us on our 1965 rancher. I always wanted a scallop and little shelves around my kitchen window; I finally got them. 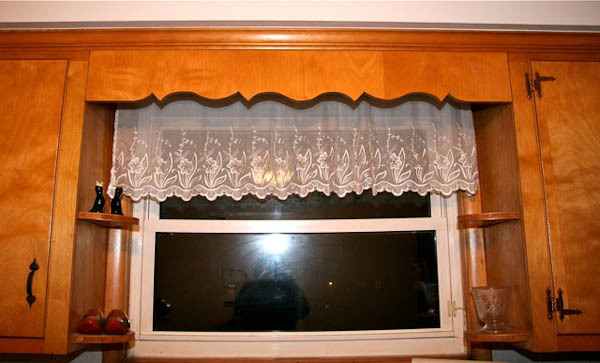 They’re simple touches, but we’re so glad they weren’t destroyed with an update; yay! 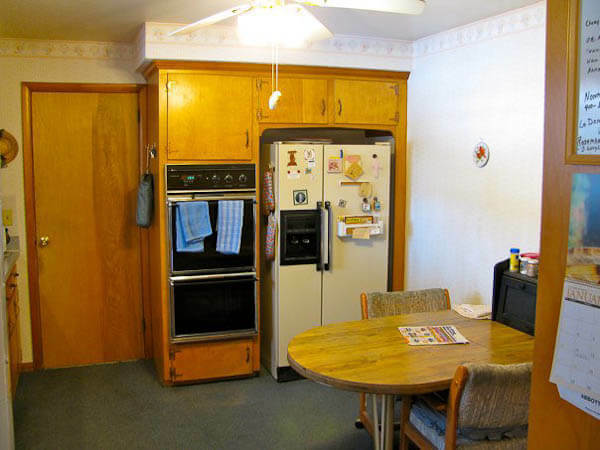 When we moved in, we tolerated mid-70’s dark blue indoor/outdoor carpeting in our kitchen. It was oppressive (and smelled like the previous owner’s golden retriever on humid days), so new flooring was high on the list of must-do’s. Our new Marmoleum is Bleecker Street red and Silver Shadow light gray checkerboard, with a Volcanic Ash dark gray border to help ground it. We’d initially intended to do a black and white check, but absolutely fell in love with the way the red warmed up and complemented the original cabinets. The grays help pull our drab mid-80’s gray countertop and ceramic backsplash into the room and look a little more like they belong there. The rugs are Capel Gramercy in Songbird. Their colors are muted compared to the tile, which helps keep the flooring from overpowering the room. 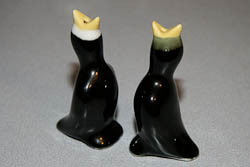 Pie birds, kitchen & stuff! 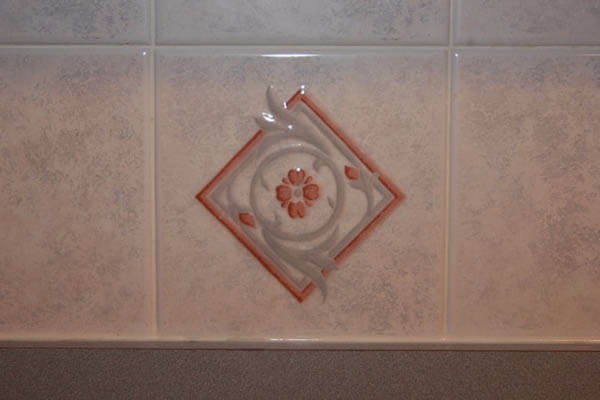 I’ve included a pic of one of the backsplash tiles. We really do not like them, but, as with the countertop, the backsplash looks better now that we have the new flooring because the reds & grays tie together. 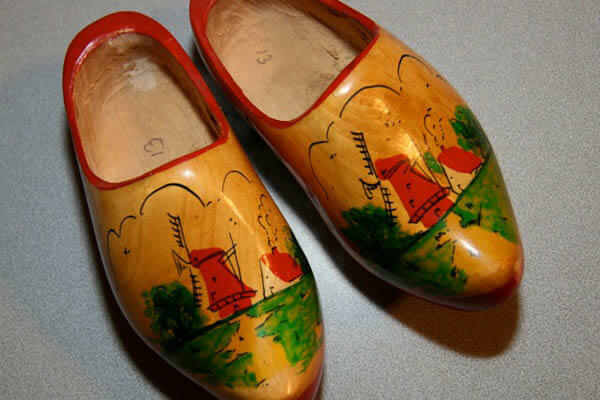 The dutch clogs were always hanging in my grandaunt’s kitchen, and the trivets were my husband’s grandmother’s. perfect for our red floor. How we ended up in the house is really a very simple story. New homes lack personality. We ended up in our perfect house because we wanted an older home with character. 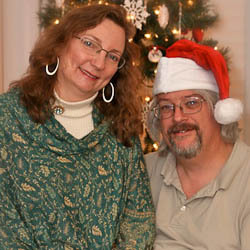 We both grew up in the 60’s and wanted something that vintage or older, plus, it’s flat! We intend to live in this house the rest of our lives, so flat was tops on our requirements list. Once we’d begun looking at 50’s/60’s ranchers, it was all over! We loved what we were seeing and knew we wanted to be in this neighborhood, where every house is a little different from every other. We chose this particular house despite its blue indoor/outdoor kitchen carpeting, its purple bathroom, and its overdose of mid-80’s mauve & cream because we gleefully looked past the decorating to see its good retro-able bones. We also liked the many mid-60’s touches that remained, such as the ceiling fixtures in all three bedrooms – atomic pattern on the shade and pindots on the metal rounds that make awesome patterns on the ceiling! Just plain fun! You’ve seen what we’ve done with the kitchen. Though we initially talked about completely re-doing the purple bathroom I found the perfect MelinaMade “Jetson White” fabric for it, again thanks to your site! Now I have to confess the purple is beginning to grow on me, especially since I know the tiles are original. I haven’t sewn the curtains yet, but the tide is already turning in favor of keeping the purple. The vanity was replaced in the 80’s, so we’re planning to replace it with something MCM at some point. As for the mauve & cream: it’s GONE! We’ve painted the living & dining rooms a butterscotch-y gold, probably more bungalow than rancher, but we like it. 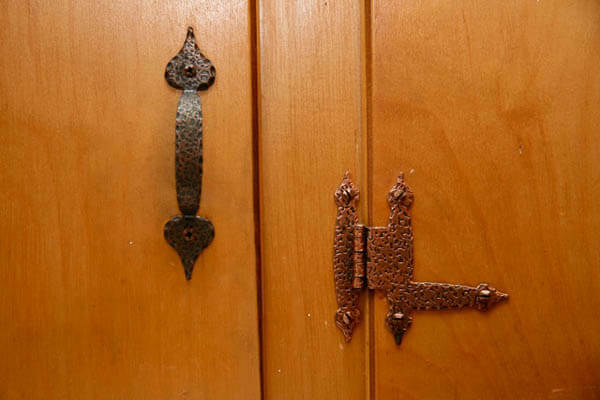 Without your site, we never would have known we could get all this cool stuff to make our home quite possibly even more gorgeous than its former glory. 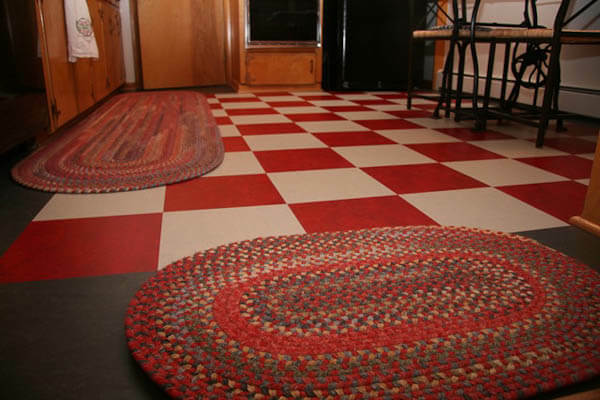 I’ve been looking for materials for a red/white checkerboard floor for several years (!) and just stumbled on your lovely site and Donna’s beautiful kitchen. Donna, I ordered a sample of the Marmoleum Bleecker Street red (the only red they have, I think )and (in the very small piece they send as a sample) it looks like a very different red than your floor–very dark. I’m wondering if it’s just due to the small sample size? Perhaps you had the same experience but it looks different in large tiles once installed—Any thoughts? (I’ve also looked at Armstrong but no one seems to have red nonvinyl tiles for residential use). 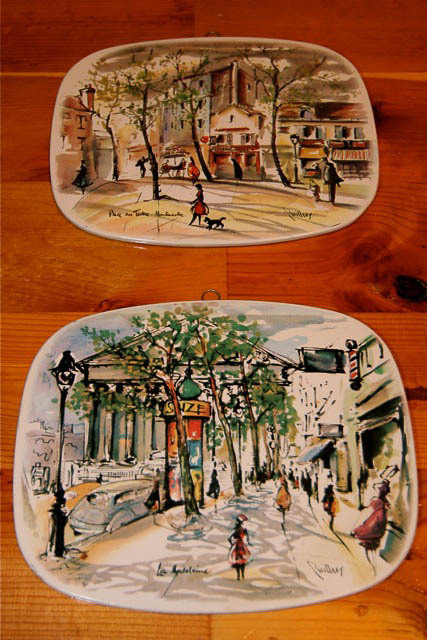 Does anyone know the artist of the two trivets? I didn’t know they were trivets; I have an old one (painted by a different artist, though), and because it has a hook at the top, I always just thought it was artwork. I Googled the artist of mine but found nothing. Mine also doesn’t have a “title” painted on it. I’d love to find more! Hi, realy lovely kitchen, I love it. I am spanish and I live in the south of France. I’m looking for a peace of red and white linoleum floor like yours, to put in my red and white combi Volks Wagen! It will be very kind of you. omg. that’s my kitchen. 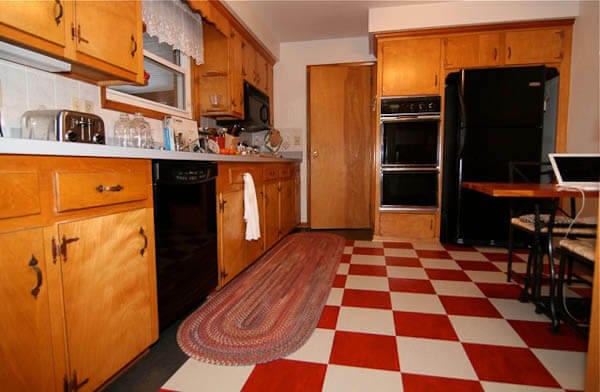 but 1950. where can i get the same floor linoleum with blue squares as opposed to red? Hello Donna, I enjoyed reading your article about how you switched up on your floor, I am building a man cave, and red, white with a tad of black has always been my favorite combination. [Edited.] 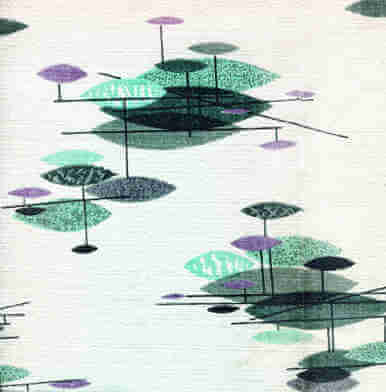 However, I would like to know the name of the rugs the company because I want to purchase those rugs. Thank you Donna, have a great and blessed day. Zohaib, these are called braided rugs. You can find them from companies like Thorndike Mills and Capel. In the story, Donna explains that these rugs are from Capel.